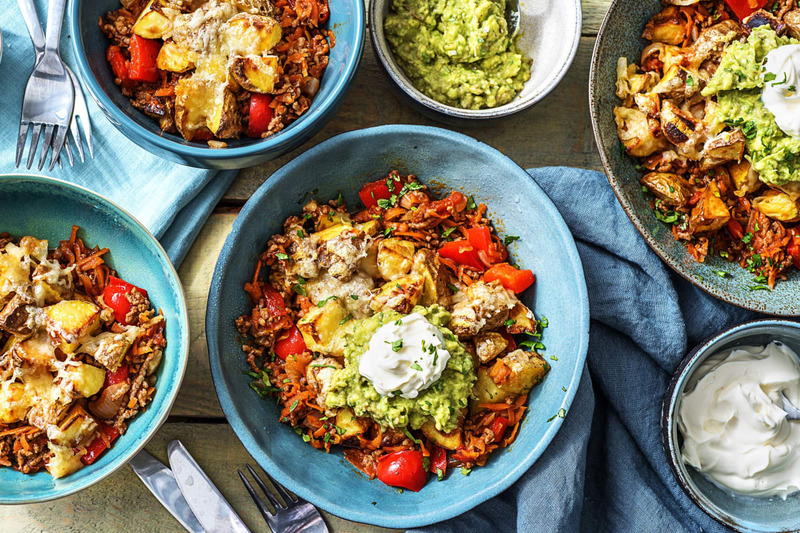 We’ve given cottage pie a Mexican twist by seasoning the beef with our special central American spice, topping it with crispy cheesy potatoes, and serving it with a good dollop of zesty guacamole and sour cream. Super simple to put together, and bursting with big, bold flavours, this is comfort food with a kick. This recipe card will be hanging in your hall of fame in no time at all! Preheat your oven 220°C. 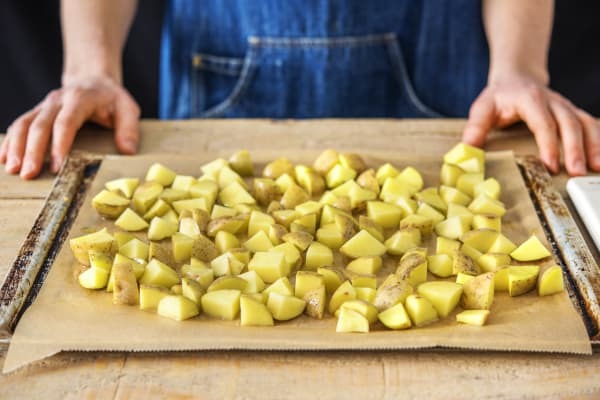 Chop the potato into 2cm cubes (no need to peel!). Pop on a lined baking tray and drizzle with olive oil and add a pinch of salt. Toss to coat, spread out and roast on the top shelf of your oven until crispy, 25-30 mins, turning halfway through cooking. TIP:Use two baking trays if necessary, you want the potato nicely spread out. Meanwhile, halve, peel and chop the onion into small pieces. Halve the pepper, discard the core and seeds then roughly chop. Heat a splash of oil in a frying pan on medium-high heat. 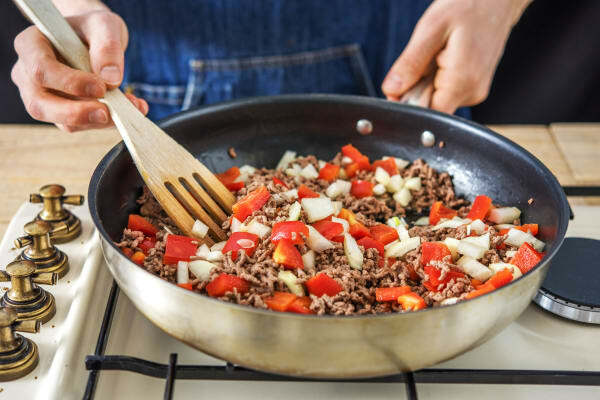 Add the beef mince and cook until browned, 4-5 mins. Break it up with a wooden spoon as it cooks. Add the pepper and onion to the beef, stir together and cook until the veggies are soft, 5-7 mins. Add a pinch of salt and pepper. 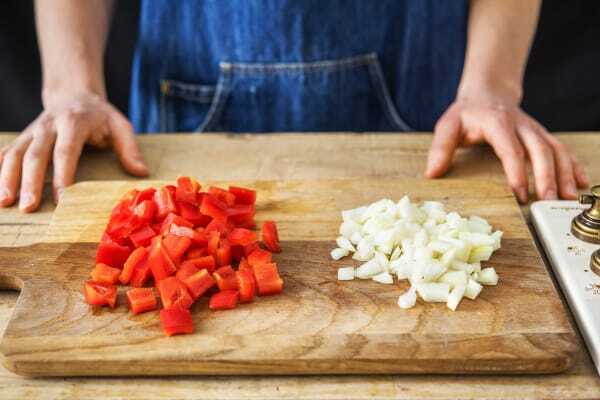 While the veggies cook, remove the ends from the carrot and coarsely grate (no need to peel!). Stir into the pan once the other veggies are soft. Finely chop the coriander (stalks and all). Halve the avocado lengthways and twist apart. Remove the stone and slip a spoon around the edge of the flesh to pop it out of its skin. Put in a mixing bowl. Halve the lime and add a squeeze of juice from half of it, along with a pinch of salt and pepper, to the avocado. Mash with a fork until smooth. Taste and add more salt, pepper and lime juice if required. Grate the cheddar cheese. 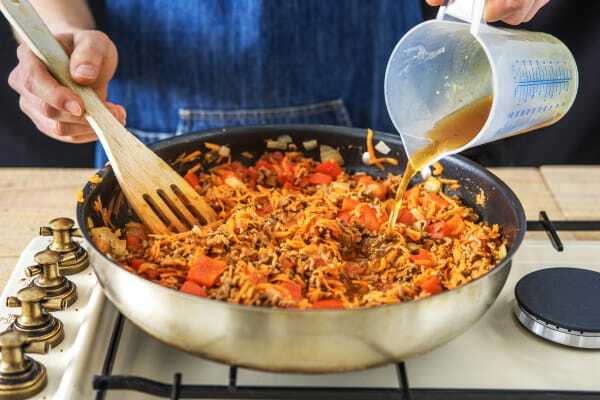 Once the sauce has thickened, spoon the beef mixture into an ovenproof dish. 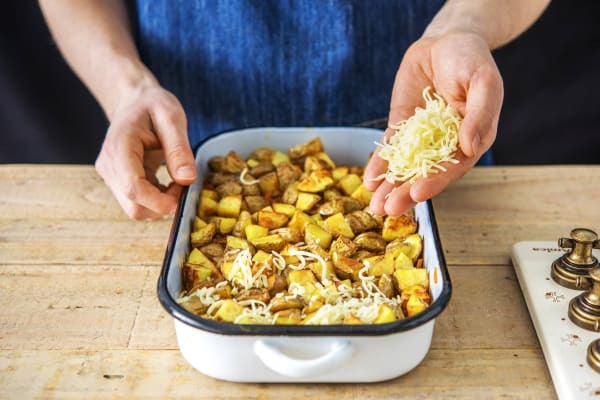 Top with the roasted potato and sprinkle over the cheese. Place on the top shelf of your oven and bake until the cheese has melted and is nice and golden, 10-12 mins. 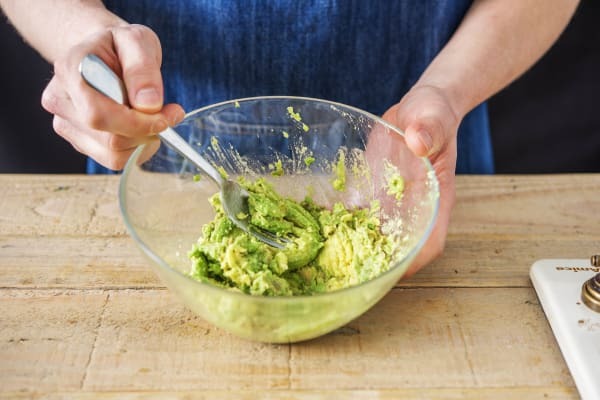 Once golden, serve in deep bowls with a dollop of guac and sour cream. Finish with a sprinkling of coriander. Enjoy!